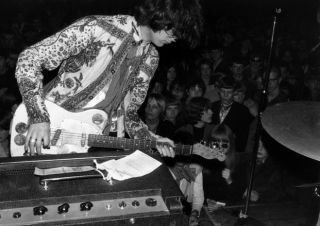 New Jimmy Page-Produced Yardbirds Compilation Features Early Version of "Dazed and Confused"
Before he wielded the hammer of the gods—and a Gibson Les Paul or two—as a member of Led Zeppelin, Jimmy Page was a Telecaster-wielding Yardbird. An analysis of Jimmy Page's soulful, distinctive lead guitar style by Guitar World's Jimmy Brown. The Yardbirds have announced the release of a new two-disc live/documentary DVD, Making Tracks. The Yardbirds have announced a North American tour that kicks off August 26 in Ontario, Canada, and winds up September 15 in Virginia.